BleachHouseLibrary.ie: #IrishFictionFortnight - Day 13 - "The Life You Left" by Carmel Harrington. Author Feature & Giveaway. 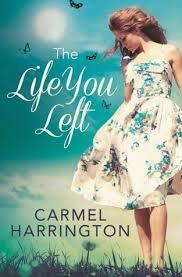 #IrishFictionFortnight - Day 13 - "The Life You Left" by Carmel Harrington. Author Feature & Giveaway. Thanks to the author, there is a PB edition of her novel to giveaway as part of #IrishFictionFortnigght. Just enter via rafflecopter link below. Wife, mother, foster parent, friend, student, lover of all things Mr Darcy & Donal Ryan, book blogger, guest reviewer on Writing.ie and Ireland AM, the person behind Irish Fiction Fortnight. That my friends, is the powerhouse that is Margaret Madden. I joined twitter in 2008, when I was a newly wed. The reason I share this little bit of nonsense, is to explain why I chose the alias HappyMrsH. Get it? Yep? Despite twitter’s hype, I just couldn’t get my head around it’s popularity. I can remember fretting about what my first 140 tweet should be, afeard I’d break some unknown etiquette and make a show of myself. Eventually, I got brave and said hello to the folks of twittersphere. (I had at least ten followers back then!) Guess what? Despite all my editing and reediting of the perfect tweet, I was promptly ignored by the lot of them! Feckers. After a few weeks, I decided that twitter wasn’t for me. But then in 2012, I had just completed my first novel and popular opinion seemed to be that writerly types should hang out with the cute blue bird. So, I decided to give it another go. To my surprise, this time, something clicked - at last, I got the hash-tag phenomenon! For me,Twitter is an effective way of catching up on the latest news. I love that I can scroll through tweets and read updates and headlines from friends and like minded people - on any subject, at any time! Now I know that social media gets bad press sometimes. But for me it’s been hugely positive. Because, as a direct result of it, I’ve made some great friends. 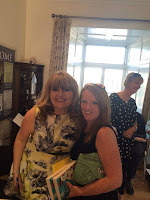 Can you guess where I met the bold Margaret Madden so? Yep, you got it in one. Twitter! 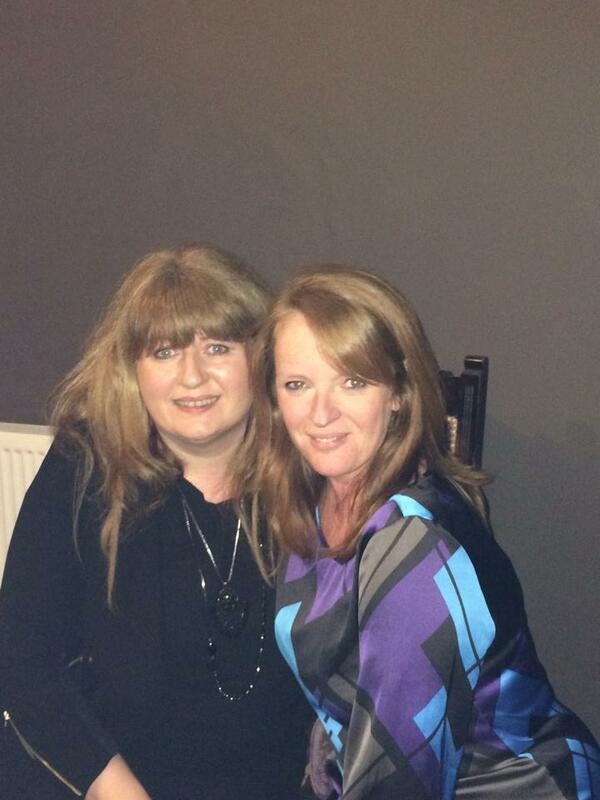 She, thankfully, didn’t ignore my tweets and soon we became pals, happily chatting and giggling about books. We also, once or twice, solved the problems of the world. Amazing what you can accomplish in 140 characters. One day she tweeted that she’d just reviewed Beyond Grace’s Rainbow. 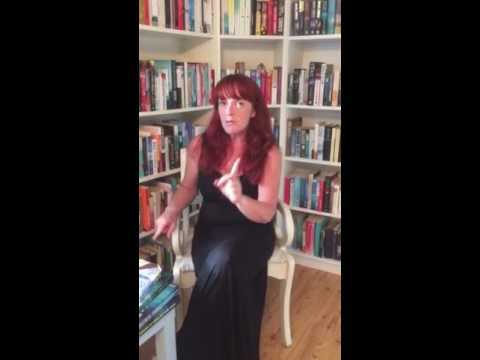 I was already a fan of her reviews - always honest and fair - so couldn’t wait to see what the red-haired woman from BleachHouse had to say about my book! If you want to have a peek as to what her verdict has been on both Beyond Grace’s Rainbow and The Life You Left, you can find out here! Then, in 2014 fate stepped in, to orchestrate a meeting in person. I ran a competition in Ireland, to win a visit from myself to a book club. To my delight, Margaret and The Esquires Book Club were one of the winners picked out! A date was set and off I set to Margaret’s beautiful home. She invited me to stay the night and sure it would have been rude to say no, so armed with posh cakes and wine, I attended my first book club as an author. I’ve since done this a few times, as it happens, in Ireland and overseas, as far away as New York. Aside from connecting with fellow book lovers, it’s a wonderful way to make new friends and on that night I made many. To my joy, I found that it wasn’t just on twitter that Margaret and I connected. Without the 140 character limit, boy did we do a lot of giggling and chatting. (Ok, maybe there was wine guzzling too!) 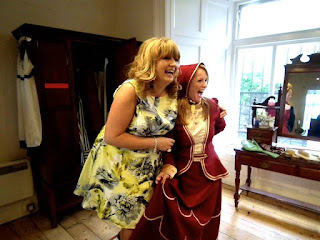 To find out all the gossip on that night, check out this blog post I wrote about it here! When my editor suggested that I ask book bloggers to help make my Beyond Grace’s Rainbow book trailer, I immediately thought of Margaret as one of the contributors. I knew she’d do Grace and the gang proud and she sure did. To see her doing her thang with style you can take a look here! You’ll also get a sneaky peak at her amazing library too in the video. I see Margaret regularly now, at book launches for various author pals. Her smiling face and wicked sense of humour always make me seek her company out. She travelled to Wexford for the launch of my second novel The Life You Left and here’s one of my favourite pics of us having some fun together in Enniscorthy Castle, where she couldn’t resist dressing up in period costume! If you know Margaret, this won’t surprise you in the least. The Irish writing community are very lucky to have Margaret on their side. She constantly campaigns for Irish Fiction, supporting both authors and publishers, with her endeavours to share our books with the world. Thank you Margaret for all your support to over the years. And thanks Twitter for your help in aligning the @ and #’s so that we fell across each others tweets. The Life You Left is published by Harper Impulse and is available in paperback and ebook format.